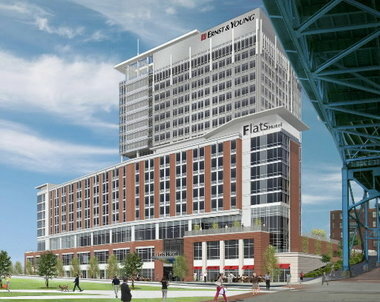 We continue to be impressed and excited about the new development taking place throughout the city of Cleveland. In particular, the activity concentrated around downtown, along the Health Corridor and into University Circle highlights what appears to be a real shift in Cleveland's economic outlook. For too long, the county, the city and the business community throughout Cleveland failed to effectively work together and get things done. It is nearly impossible to put blame on any particular person or group, as the failures of Cleveland have been a combination of failed government leaders and business leaders, fairly or not, seeking to move away or disengage from the corruption and challenges of our area. This is all changing. The Plain Dealer has put together a great map (included below) of the current development projects either in process or being planned in their story from yesterday. Most impressive is what is actually under way. As we've learned time and time again, anything "planned" is not worth much until money is secured and we see a shovel in the ground. Of the 11 projects bigger than $100 million, only two are planned; the rest are either completed or under construction. In all, there are 84 projects listed, of which only 24 are planned. Better put, nearly $5 billion of the listed projects are either under construction or already completed. That is a huge number for a region that has seen decades of population loss and a move to the suburbs. Yes, we note that a number of these projects, some of the largest included, are public works projects that do not necessarily add to real growth. Getting some of these projects done, however, we think buttresses the private or public/private projects. The best example is the inner belt reconstruction. The casino and med mart, along with a new office tower and growing health tech corridor, will hopefully bring increased downtown traffic. A major overhaul of our half-century old, antiquated freeway exchange doesn't sound like a bad idea. ﻿This weeks NEO CRE Play of the Week goes to Neil Viny at The Dalad Group for his acquisition of Essex Place on Rockside Road. Dalad Group, who is already a major player in the Rockside market, added the 80,000 SF Class A office property to their portfolio. Currently at 80% vacancy, Essex Place was one of the casualties of the economic downturn and battered Rockside sub-market. We at the CREInsider applaud Mr. Viny's foresight and timing (not to mention financing) of this acquisition as market fundamentals continue to improve not only Rockside but across Northeast Ohio. With a $2.9 million purchase price he should be poised to make some very competitive deals. More on his acquisition was reported in Crains Cleveland this week. In a move that surpised just about everyone in the Northeast Ohio Commercial Real Estate community, Monte Ahuja announced yesterday that he purchased the $5.7 note on the up-scale Barrington Golf Club in Aurora, OH. Ahuja, a long time Cleveland philanthropist and former owner of Transtar Industries hopes to convert his debt position into an ownership position in the near future. In a time when many Northeast Ohio golf courses and private clubs continue to struggle, Monte stepped up and made a bold statement about his commitment and belief in this region and that is certainly deserving of the NEO CRE play of the week. CRE Finance Council Recap - Optimism and Cash! 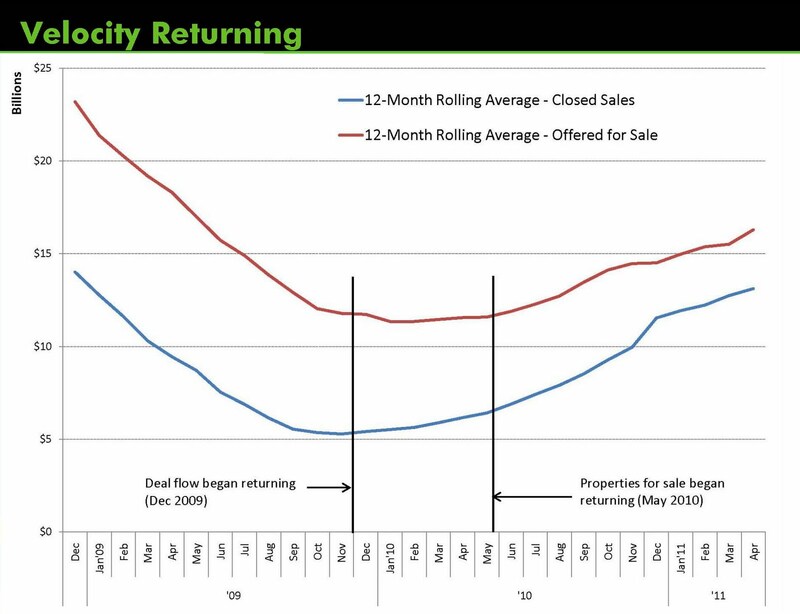 A colleague of ours in CBRE's Debt & Equity Finance group, Jason Brown, does a great job at sharing information on the debt markets with those of us in investment sales. Most recently, he provided a summary from the CRE Finance Council meeting assembled from him and his colleagues in DEF. Interesting of note for us at the Insider is that the mood seems to support lending in the rust belt states like Ohio on just stabilized deals. Well, we can definitely attest to that. 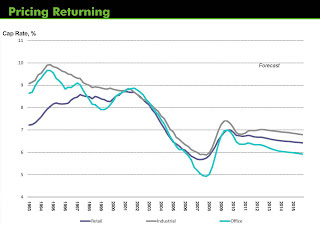 Separately, retail seems to be leading the pack on property type, but we would expect to see a big swing towards office and industrial this year. This is probably particularly true in secondary markets where STNL and grocery-anchored retail have been the most sought after assets in the last couple years. But enough of our commentary - on to the experts. Several of the Debt & Equity Finance team members attended the semi-annual CRE Finance Council conference. I thought I would pass along the feedback received on the state of the credit markets, especially the CMBS/conduit market which has been making a comeback. Mood of the conference was pretty optimistic as there is A LOT of liquidity in the CRE space. Not enough product to go around to satisfy all the piggies at the trough. Recent blow out of spreads put a damper on some of the mood as there is very little risk tolerance for losing money as some of these institutions get back into this business. All the regulatory uncertainty is definitely having an impact on the industry. Nobody knows for sure what the rules of the road will be. Eg; risk retention, capital allocations in general, B Buyers not controlling the special servicer, ability to monetize the IO strip, requirement of B Buyers to hold their investments for 5 plus years, etc. Stay tuned. Depending on how the regulatory framework evolves, we will have better clarity on whether the non-bank owned Conduits can thrive. Most think the big commercial and I-Banks will be the major players when the dust settles, but this is not a certainty. 2011 issuance levels will probably be in the $40 to 50 B range. Very few are predicting more will get done this year. Not enough B Buyers in market now. Only 5 or so real buyers per some experts. Consensus is that buyers will emerge once the rules are set and yields are high enough. Product/What kind of deals are Conduits winning? They will go to secondary and tertiary markets ( $85M office bldg loan in Tulsa). Leverage goes down and structure goes up as the markets get smaller. Conduits tough on acquisitions. Too much interest rate and execution certainty risk. All underwriting to debt yields in 8 to 12% range depending on product, market, LTV, etc. Lowest for MF deals. All underwriting income in place. Very little creativity. Not much fun. Expensive and cumbersome. Don’t expect your client to pat you on the back at closing. Some Conduits marketing an ERL execution, but latest language is full of outs for the Lender. ERL Agreement completely one-sided. Be very careful here. Carve-outs are a big issue. Some reaching for more backdoors to recourse. Need very close attention and negotiation, if possible. Not much room for negotiation of loan docs. What a difference a year makes. Total U.S. investment transaction volume was up by 120% in 2010, compared to the same period in 2009, and overall cap rates were down 30 basis points (bps) to 7.4% according to Real Capital Analytics (RCA). This trend not only continued in 2011, but also sped up. Commercial property sales reached $44.2 billion through April, a 75% increase over the same period in 2010, at an average cap rate of 7.35%. Continued investor demand for core assets in primary markets has been a significant factor to increased sales, but activity is increasing in secondary markets such as Northeast Ohio as well. We have seen a large uptick in activity over the last two quarters in properties offered for sale. Consequently, the trend in the secondary markets appears to be the reverse of the primary markets – new offerings are preceding sales. Since secondary markets generally present more risk and less growth, this trend makes sense as investors ease away from the primary markets as supply tightens. Investors interested in Northeast Ohio are seeking safety or stability, or both. As a result, properties which attract the most interest include single-tenant, net-lease with long-term credit; grocery anchored shopping centers; medical office buildings near or on hospital campuses; senior housing; and sale-leasebacks. The amount of capital chasing these assets continues to increase, and the lack of supply in certain markets has created a “scarcity premium,” driving pricing to levels we have not seen since 2007, even here in Cleveland. This is combined with historically low interest rates and a return to more reasonable credit underwriting to drive the pace of property dispositions. Owners of these properties should evaluate whether a possible sale now makes sense to take advantage of the scarcity premium. Low interest rates are also helping to stabilize cap rates for properties that may not necessarily fit into one of the “hot” property buckets. Either way, as we look out on the horizon, we see continued loosening of the capital markets and good opportunities for investors and owners alike. Apparently the economy is not responding the way we all hoped a year ago. Business growth has slowed along with employment. It seems consumers are driving any recovery at all right now. This has limited new real estate projects to build-to-suits and renovations, especially in Northeast Ohio. So when we saw the latest news headline that the ice cream business is booming and new facilities are being built, we thought what a great way to bring the economy back and hopefully commercial real estate with it. Considering it is like the tundra in northern Ohio 6 months out of the year, we may question this cool strategy, but hey, after the last few years, we're ready to try anything. Ohio adopted some new tax incentive rules recently which helped retain American Greetings in Northeast Ohio. At the time, the legislature and Governor said there would be more benefits than just AG. Well, we now know the next one is Diebold, a long time corporate resident of Akron-Canton. Diebold, which is known for its safes, is planning on spending $100 million on a new corporate campus. The Plain Dealer is reporting about $56 million of that will come as tax incentives. This is actually the third major corporate campus that will be built in Northeast Ohio including AG and the new Eaton Corp. campus on the east side of Cleveland. Co-Star recently reported on a proposal by the Associated General Contractors of America, an industry trade group, to help stimulate construction projects in the US. The full plan is included below. What's striking about this proposal is that it explicitly recognizes what really drives new construction and investment, e.g., employment and consumer demand, but then goes on to list a couple dozen proposals that may have limited or no impact on either employment or consumer demand. Not all the proposals are bad per se, but many are the types of things that lead to one-time bumps or special tax treatment. For example, the report suggests that faster cost recovery provisions related to leasehold improvements should be made permanent, e.g., speed up depreciation. While this may be a fine idea, it's not the sort of thing our CRE market needs for a wholesale comeback. And speaking of taxes, that's where many of the proposals are focused - tax reform or tax provisions. All 12 of the proposals to "boost private sector demand" are tax-based. We question whether developers and companies will take on a new construction projects because of more lenient tax laws instead of actual demand. They might, but there seems to be a bigger problem anyway - getting the capital. From our perspective, the bottleneck for new construction (useful, needed construction that leads to permanent, private-sector jobs, not the types of projects AGC suggests just to maintain artificially needed construction jobs, like "navigation and flood control needs") is two-fold: 1) money, and 2) money. We see strong demand for new projects. New industrial, particularly in NEO, seems to be coming back. Large users don't want antiquated buildings - they want modern, efficient buildings. That has created opportunities. The medical and senior housing markets are also seeing strong demand for new builds or renovations. 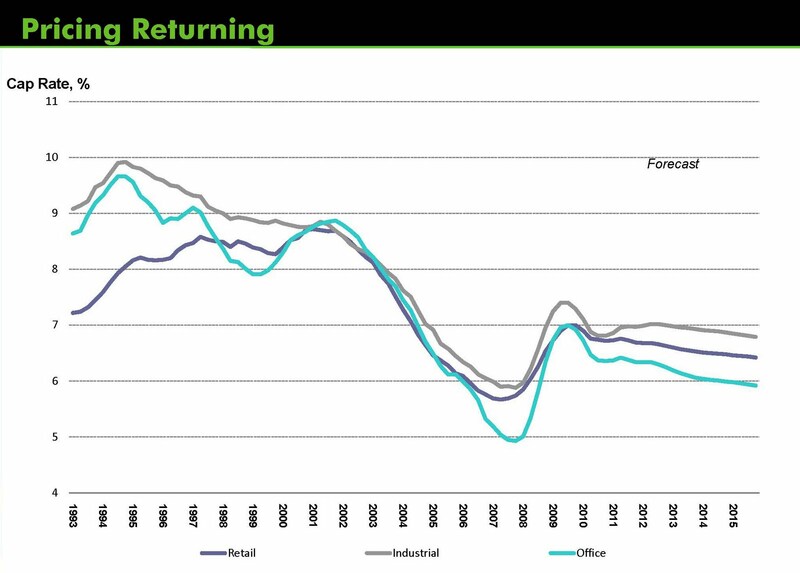 Retail, on the other hand, unless in the strongest of markets, is not going to resurge for awhile. But the problem with all of this is money, capital, investment, call it what you will. A significant amount of our time is spent on, and clients continue to seek, capital for new projects. And while it is possible to find investment money, it's very difficult. Unfortunately, AGC doesn't really address this. Just one proposal addresses private investment in real estate projects, though a few others indirectly address it, such as expanding private activity bonds or Build America Bonds - both of which can lead to the over leverage problems we've already had. We understand AGC is a trade group and must endorse and push a certain legislative agenda that specifically supports its member base. We just wish the proposal was less about tax incentives and more about finding money for the people trying to get their projects moving. Updated 3/8/11 - Turns out tax incentives do work. American Greetings is staying in Northeast Ohio, even if they don't know just where yet. The bill passed by Ohio's legislature and quickly signed by Governor Kasich was the difference. The Plain Dealer has good coverage here, which includes a video, time lines and several other good points of information. The original post is below. American Greetings, the well-known card company, has much more incentive to stay put in Northeast Ohio. House Bill 58, set to be signed by Governor Kasich, was approved by the House on Wednesday, as the Plain Dealer reported. The bill creates a new refundable job retention tax credit. AG has been toying with the idea of moving to Chicago, which would have been a hit to a Northeast Ohio economy that is slowing, but successfully, clawing back. (As a side, just because the Insider is a superhero movie nut - Cleveland is where the new Avengers movie will be filmed...). AG's commitment to the city of Cleveland is important on a number of fronts, not just financially. AG is a dynamic company that recruits and wants to retain young talent. That is something Cleveland needs and can support, but we need high-profile companies like AG to make sure they are here. AG staying will also help in discussions with various airlines' commitment to the city as two proposed mergers move forward - Delta and Continental (who has a primary hub here), and Southwest and Airtran, who compete as the low-cost carriers between the Cleveland Hopkins airport (Southwest) and the Akron-Canton airport (Airtran). Greg Greene is a Senior Vice President in CBRE's Debt & Equity Finance and has a long, successful career in the capital markets. Greg attended the recent MBA conference and was great enough to share his thoughts with us, which we are providing to our readers. We have put in bold several of Greg's points we found most interesting or telling about where we are today and italicized our thoughts. The spirit of the conference was one of optimism; however some anxiety remains as the difficulties of 2008 through early 2010 remain fresh on the minds of most lenders. • There is a very substantial amount of capital committed to commercial mortgages in 2011. • Most lenders are concerned that there will not be enough product to absorb the capital committed to these mortgages. This is a continuing problem throughout the commercial real estate market, not just on the financing side. 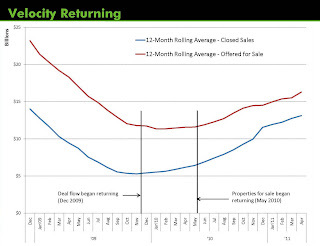 We consistently find demand outpacing supply. This is changing, but we believe all of 2011 will be needed to re-balance the market. • Life companies have a large appetite for commercial mortgage placement due in part to the fact that the yield on these mortgages is favorable to the yield on corporate bonds. • Some money center banks are starting to quote non recourse deals for ten year terms, making them more competitive with life companies and CMBS at the longer term. 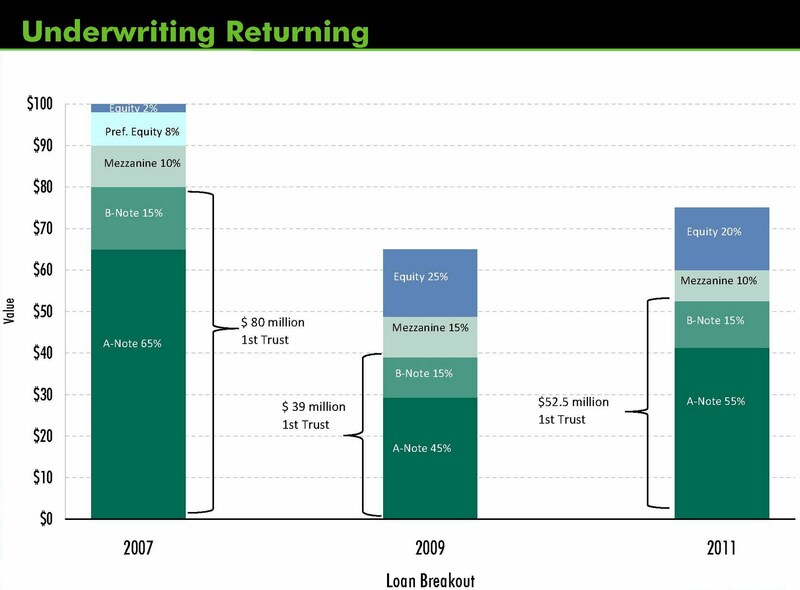 • Many lenders stated this is starting to feel somewhat like 2005. • The CMBS platforms are very active and their underwriting is reflecting the competition in the marketplace. This does not imply that the CMBS lenders or others are engaged in loose underwriting, but the box is certainly expanding for the definition of a “financeable” deal. This is good to see. A year ago, we felt lenders were too confident, which borrowers did not appreciate. • Numerous lenders expressed some doubt that all the current CMBS platforms would survive. The expectation is for mergers and for a few to drop out as volume is not sufficient to warrant the continued investment in the platform. • Lenders are exploring ways to improve yield and get more money invested. There is a wide expectation that bridge loan opportunities will provide this outlet as debt is provided for assets that must be repositioned or assets that will be released from the commercial banks currently holding those assets. • There is a desire (hope?) that the commercial banks will begin to more aggressively sell off the real estate assets they hold. The banks have seen a material recovery in the value of many of those assets and many of the banks are now in a better capital position to sell the assets and absorb a much reduced loss. However, like it or not, most people believe that “kick the can” has served the banks and the industry rather well over the last two plus years. We have already seen a pick up in requests from commercial banks to start moving, or at least to begin valuing, under performing assets. We hope the "pretend and extend" phenom is over. • Many lenders stated that real estate values have recovered faster than anticipated in many markets. • The CMBS platforms and a few life companies stated they will finance to a 75% LTV. This confirms what I am currently seeing in today’s market. • Some lenders will provide forwards---but this number is relatively few and the number of months to go forward is limited. • A substantial amount of capital is dedicated to mezz debt. Rates start at around 8% and increase from there with a rate of 8% to 10% prevalent for deals in the 70% to 80% LTV range. Terms range as long as ten years. • Most lenders expect more dispositions from special servicers throughout 2011. • Most lenders remain underweighted in industrial mortgages and would very much like to add industrial to their portfolios. • Some life companies have become very competitive with Freddie and Fannie and are now winning business from the GSEs. Considering that Congress is upended the GSE's, this is probably a good thing for the real estate market; unless of course we're going to see pricing from the GSE's go up as the government guaranty subsides. • Many lenders maintain a preference for the mezz debt structure instead of the preferred equity structure that gained some popularity in the preceding months. • The current recovery remains a jobless recovery and there will be no real economic recovery until the U.S. can generate jobs. The recent positive jobs report for January is already being refuted by numerous sources that consider it more “accounting trickery” than fact. • The “joke” coming out of last year’s MBA was that loan spreads fell 50 basis points in the three days of the conference as everyone realized how much money was re-entering the commercial mortgage market in 2010. The “joke” this year is that the previously held expectation of $50 billion in CMBS lending in 2011 has now become $70 billion. We shall see, but don’t be surprised. This remains very light compared to the $250 billion plus for CMBS issuance in 2006. • The competition for new loans will intensify. Lenders will increase LTV’s, finance more non-core assets, provide a longer interest only period, enter more tertiary markets, accept lower DSCR, etc. These are the logical actions for an industry that likely has more debt capital available than deals to absorb that capital. • However, do not expect silly lending practices. The mortgage industry is filled with smart people who remain cognizant of the lessons of the recent past. • CMBS will be very competitive and will provide much of the needed capital to finance lesser quality assets and quality assets in tertiary markets. Expect CMBS loan spreads to fall as the year progresses. For investors who like commercial real estate, but have no experience in or exposure to senior housing, now may be the time to investigate. Mel Gamzon, an industry veteran and a board member of The American Seniors Housing Association, recently shared his thoughts in an article on Commercial Property Executive. It's not news to us, but his article is a well-written, succinct summary of the market. He shares several key factors that support why senior housing is and should continue to be a good investment. We would also add there are typically strong operating margins, at least on the assisted living side, which can push 40% (before rent charges). As Mr. Gamzon points out at the end of his article, there were more than $6 billion worth of non-skilled nursing facility transactions either announced or closed in the second half of 2010. This is important for two reasons. First, there is a significant amount of focus, and consequently capital, on senior housing. Second, independent and assisted living continue to be the investment of choice, not necessarily skilled nursing. We have seen both of these trends. There are well capitalized investors with whom we deal, such as REITs, equity funds, foreign investors and high-net worth individuals, that have shown a strong desire for senior housing and are primarily interested in non-skilled nursing. The exception to skilled nursing is when there is a continuum of care model, either as a full CCRC (rental, not buy-in) or with just assisted and skilled. That's not to say there is no interest in skilled nursing, but being significantly more reliant on Medicaid/Medicare creates a different investment model that is not as inviting as assisted or independent living. Because new development shut down with the rest of the real estate market, there is a deep need for new facilities to start being built. Construction financing remains very hard to obtain and the traditional GSE capital sources for senior housing (HUD, Fannie, Freddie) present so many challenges. This has created a need for alternate financing solutions and why all of our current senior housing engagements are to source construction and development capital. According to The State of Seniors Housing 2008 report, nearly half of all independent and assisting living facilities were built before 1995. While we haven't seen the 2010 report, we can only believe that percentage has grown due to the limited development in the last couple years. 2011 is already looking like what most people thought 2010 was supposed to be - the year to rebuild. Though banks remain tight-fisted, capital is flowing from other sources. We believe that capital should and will be focused on senior housing. As everyone loves to talk about, the boomers are coming. Though we've known about the project and the financing structure for some time, the deal FINALLY closed yesterday for the construction of Cleveland's first CBD office tower in nearly 20 years. What will be known as Ernst & Young Tower, the first tenants include E&Y, Tucker Ellis, a large law firm based in Cleveland, and us, CBRE Cleveland. E&Y Tower is expected to open early 2013 and will include a hotel, conference center and several restaurants. This is the beginning of what could be a boom for Cleveland. Waiting shortly behind the Tower is the construction of the new casino, which will be housed temporarily in the Higbee Building on Public Square, and the new convention center and medical mart. These developments, along with the strong activity in the Health Tech Corridor in Cleveland's Midtown, will hopefully push Cleveland in the right direction. Scott Pollock & Steve Latkovic are Directors of Candlewood Partners Real Estate Group based in Cleveland Ohio. Candlewood’s Real Estate group provides capital solutions and investment advisory services for the commercial real estate industry. Scott & Steve are pleased to offer this Blog as a forum to update their clients on industry news and market trends that impact their real estate decisions and portfolios.